Celebrate the new arrival! Bears, Blocks, Onesies and Teethers, our baskets have everything a baby needs! Celebrating an Anniversary? That's a big deal! Our beautiful and impressive gift baskets make the perfect gift for such an occasion! "What's in your gift basket?" 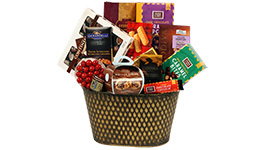 A real treasure of delicious treats in Gift Baskets Toronto. Find Ghirardelli and Godiva Chocolates, Dark Chocolate Caramel Popcorn, Brown Sugar Covered Nuts, Walkers Shortbread, Red Chocolate Cherries, Heavenly Sweets Cookies and a whole lot more! 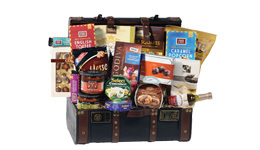 The superior selection of gourmet and sweets included in this sensational chest is a treasure trove for the senses. Included are Rogers Sea Salt Caramels, Wildly Delicious Bread Dipper, Heavenly Sweets Cookies, Sable & Rosenfeld Antipasto, Elsa’s Story Crackers and a huge choice of other items. A classic cheese board with a ceramic cheese baker makes this gift perfect for entertaining. 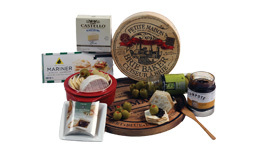 On it you will find Brie Cheese, Wildly Delicious Compote, Sable & Rosenfeld Olives, Crackers and more. Celebrate the new addition! We have a bunch of baby gifts, from cute to practical. The parents will be just as happy to receive them as the baby! There's a basket for any occasion, any person, any budget! Check ours out! All of our gifts are beautifully and lovingly packed, wrapped in cellophane, and tied with a bow! You can count on us to make presentation pop!